Travel, when it comes to my reading and writing, is a mixed blessing. On the one hand, I get extra reading time. Light reading is a perfect way to pass nervous hours on planes, and during long bus rides. On the other hand, I get less writing time. Although I can write in noisy areas like food courts or coffee shops, I can’t do it on a bus or a plane. Now I need to catch up on reviews – and that’s not procrastination. Honest. I read for pleasure, but also to learn how to write better. True, I’ve been working on Romance One for almost six years, but each revision makes it a better story, and the current set of revisions may be the last. I’m also enjoying the process of building the story. Even if I sell very few copies, a likely outcome, the time is well spent. 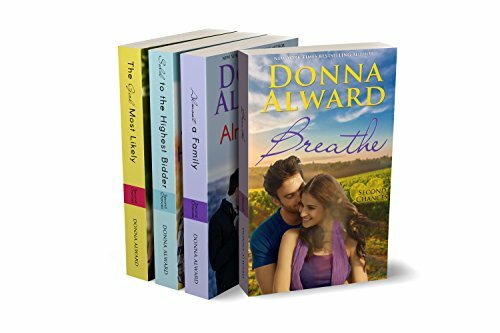 Today I’m looking at a set of second chance romances by one of my favourite authors, Donna Alward. I’m not sure why collections like this are called boxed sets – this is strictly an ebook offer. Regardless of what they call it, it’s a great deal, and Alward writes great sweet and semi-sweet romances. Buy it. The first book is Almost a Family. I previously read and enjoyed that, and it’s reviewed here. The Girl Most Likely, from 2014, reunites Katie and Ric. Close friends in high school, she turned him down for a prom date, in a humiliating fashion, and they went their separate ways. He grew from gawky math geek to successful but lonely Calgary real estate developer. She struggled through restaurant jobs and an exploitative workplace relationship that left her unemployable. Ten years after high school, she wants to open her own place, and approaches Ric for financing. He agrees, but he’s looking for a new challenge, and proposes they be partners in the project. She wants to make it on her own.Though there is a prior relationship, much of the plot is more friends become lovers than second chance. Breathe, from 2017, opens with Anna, her baby, and her four-year-old, arriving at the home of Jace. Anna and Jace were teen lovers, but he was the son of an employee at her wealthy family’s winery, and after they broke up she quickly married someone more acceptable to her family. It was an unhappy marriage, but when her husband dies in a boating accident, out with his mistress, Anna needs some time to sort out her feelings. She and Jace have kept in touch, and she thinks a guest house at his winery in BC’s Okanagan area would be the perfect hideaway. Unfortunately, the guest houses aren’t ready. He’s prepared to let her stay in his house, but his bachelor lifestyle is not prepared for children, and he’s always resented her quick marriage. Sold to the Highest Bidder, also from 2017, stretches the boundaries of second chance stories. Ella and Devin married at eighteen, but when she left town for college, she wrote a letter saying she was not coming back. They have not seen each other for twelve years, and she’s avoided learning anything about him, believing her future happiness means leaving the past behind. She wants a divorce, but he won’t sign the papers. (Where I live, if the other person does not reply to the request for a divorce, it’s granted, but either the law is different in Colorado, or this is a narrative gimmick). When her newspaper sends her to her hometown to cover a medical insurance story, she plans to visit Devin in person, and get the papers signed. And he can’t avoid her if she buys him for the weekend at a charity bachelor auction. He agrees to sign the papers – at the end of the weekend with him. But his reluctance to sign is not just stubbornness. Alward’s characters, male and female, tend to be wounded. Difficult childhoods abound, compounded by mistakes and assumptions in the early relationships, often organically rising out of the childhoods (and the characters were essentially children when they met – there are elements of YA in these stories). The common situation is a couple re-examining their former relationship with a more mature perspective, but still making mistakes and assumptions. Even the heroes are imperfect, and they don’t outgrow it so much as acknowledge it. Although a set, these are all different and discrete stories. There’s no location, location type, or character continuity, and heat levels vary. Breathe has the sexual tension and results you’d expect from former lovers sharing a house, and Sold to the Highest Bidder has a couple of well-integrated bedroom scenes. The Girl Most Likely keeps things sweet, but has a great seduction scene. It’s all the more powerful because it’s not a seduction – at least, not immediately. Sometimes the best seduction is just being a good friend. There are a few hard to swallow moments, which the characters themselves observe, some playful incidents where Alward is clearly having fun, and few loose ends, but there are also some darker elements, in the past and the present. I’m happy to see a story where children are brats, at least some of the time. Each of these stories has at least one standout aspect to recommend it, and the collection gives a happy variety of variations on the second chance theme. Alward is a former Harlequin writer who now publishes independently, and I suspect that freedom allows her to bring up certain subjects and increase suspense, leading to sweet romances that still have a happy ever after ending, but are more complex, interesting, and ultimately more heartwarming than many of the genre.